Disclosure: I received a Bomb Pops gift pack to facilitate my review and no other compensation was received. All opinions are 100% my own and may differ from yours. I will only endorse companies, products and services that I believe, based on my own experiences, are worthy of endorsement. One of our favorite things about summer is cooling off with a cold, delicious Bomb Pop. It’s a requirement of my son’s if he’s been playing outside all day. He loves them! Everything you need for a summer party — especially perfect for a patriotic themed party, but great for any party. And no summer or pool party is complete without Bomb Pops! Since we had other plans for July 4th, I’m going to use all my Red, White, and Blue patriotic party decorations and supplies for Labor Day or Memorial Day (plus I’ll have them for next 4th of July). 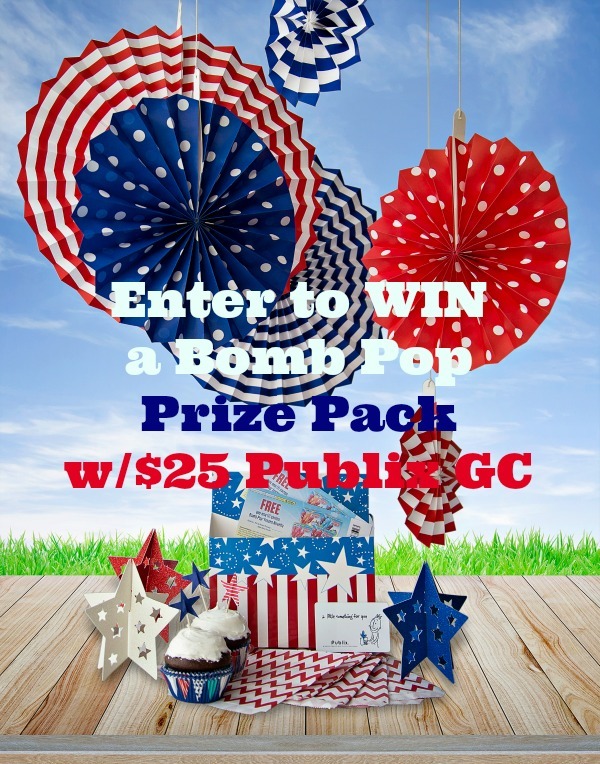 I have some great news… I have the same Bomb Pop gift pack (except you’ll get coupons for free Bomb Pops) to giveaway to one of YOU! This giveaway is open to U.S. residents ONLY, 18+ older. This giveaway ends on July 11th at 11:59. Enter on the Rafflecopter form below. Good luck! getting in my pool…the pool was so lonely all winter. After that Winter? My favorite thing about Summer is the fact that it’s not snowing! The long hours of daylight. I like being able to of a lot of gardening in the summer! I like the warmer weather so I can go into our pool. The long hours of daylight! I love the great weather! I love all of the different summer actvities, especially bringig my kids swimming. I love spending time outside with my daughter doing activities like gardening! Naps under the ceiling fan on high! Not setting any alarm clocks! I am a teacher so I look forward ot the summers where I am not on a schedule. I love the beautiful weather and in turn, the outdoor activities. cookouts with my friends! we always have a great time, with a bunch of us or just a few. The hot weather is my favorite thing about summer. Swimming and beach fun are the best to me. My Favorite thing about summer is time at Fair Haven Beach State Park here in NY on Lake ontario. My favorite thing about summer is getting to sleep late. Love those Bomb Pops! They remind me of being a kid, but you’re never too old for them! My favorite thing about summer is the summer rains. My favorite thing about summer is being able to eat also those nice cold treats and the sweet seasonal fruits. Heading to Miami! I will enter this giveaway: thank you!!! I love my vacation and spending time with my family in the summer!! We get to go swimming! My most favorite thing about summer is knowing that when I wake up at 4:a.m. for work I do not have to shovel the snow off the driveway and i don’t have to let my car run for 20 minutes to warm it up only to have to drive 5 minutes to my job. YEAH SUMMER! I love that I don’t have school and can finally take a break from the stress of it! And also I love to swim!